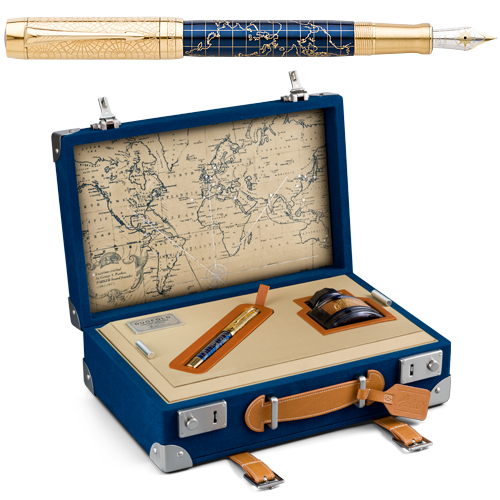 The 2018 Sonnet Special Edition is a collection of unique pens that celebrates something that connects all of us: our curiosity and desire to discover the unknown- a mind set that embodies the intrepid nature of founder George S. Parker. Every writing mode employs technology and engineering to satisfy the highest standard for comfort, reliability and performance. Bold, yet understated, elegance and contemporary design. The Premier distinctive design elements are given an air of modern luxury for these special Premiers. Advanced design, superior writing comfort and durability. Advanced design, superior writing comfort and durability with elegant rose gold plated trim and 18kt gold nib. The smart glide tip is designed to produce a dark, clear rendering and prevent hand smudging on the page. Sterling Silver enhanced with luxurious chiselling. Modern and elegant patterns enhance the beautiful IM Collection. JOTTER XL The Everyday Icon now in Larger Size The classic Jotter pen design has been modified to make writing more enjoyable for those you prefer a large pen. A new Special Edition Jotter series inspired by the most renowned buildings in London. The Parker Jotter Stainless Steel fountain pen is a Streamlined style with clean lines for a fresh take on the iconic PARKER Jotter design. Mint Parker Classics from the Past!